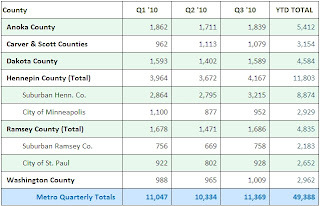 The Minnesota Home Ownership Center has compiled the pre-foreclosure notices received by the statewide network of Housing Counselors through the end of the third quarter (September)... and the upward trend continues! 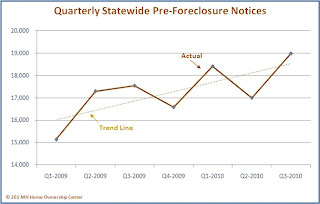 The most recent quarter (July through September) recorded the second-highest number of pre-foreclosure notices since the MN legislature enacted the notices in the third quarter of 2008. Year-To-Date, the total number of pre-foreclosure notices received has now exceeded 54,000. 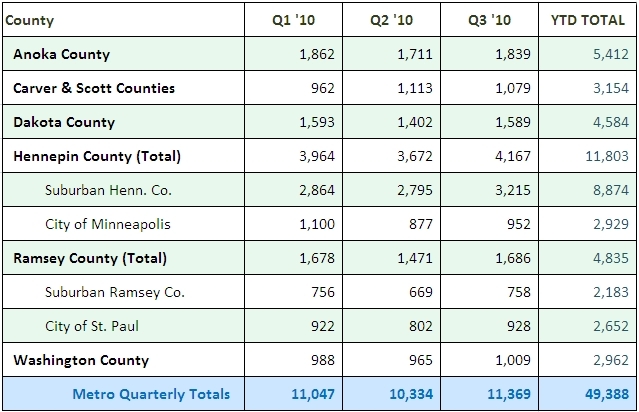 This information makes it hard to forecast anything but continued foreclosure activity and continued mortgage difficulties for Minnesota families. As always... if you're struggling with your mortgage payments - or think you might fall behind soon - don't wait! 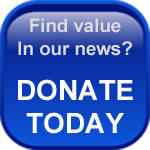 There is a network of non-profit agencies that can help. Contact them today. For additional information about foreclosure prevention in Minnesota - visit the Center's foreclosure prevention resource page here. Moving? Where are you going?